WARNING! Turn down the sound on your computer before playing the video. You do NOT want to hear a hyper giant schnauzer at full volume. I'm not sure who is more focused, Griffin on Maggie or Maggie on ignoring him. For some odd reason Duke likes Griffin, even when he crashes into him or runs him over. wow that is loud but then again so am I! Have a great Saturday. Hope you're not that loud! 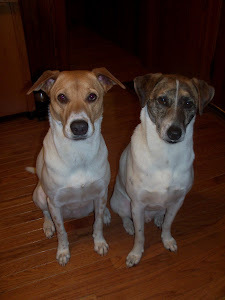 Issues or no issues, we think U guys are two handsome dudes!We never wear collars at home too.Glad we found you. Hey! did U say u live with one lizard? We have five here when we last counted. They never come down to play with us but if u guys come along may be we can persuade them to! We have one Solomon Island Skink named Doug. He doesn't like to play with anyone either! Hey, Maggie is a girl, not a dude! HI GUYS!! You are pretty darned cool (but is Griffin YOURS? Wow is he noisy!! MOL!) thanks for visiting me! I am visiting you and I am going to tell my Sheltie brother about you! Did you know that my Sheltie brother has a blog too? It's Dakota's Den! He would love to meet you! No way! Griffin is my parents' dog, he's only this noisy when he wants our dogs to run & play. They stop running when they get too hot, he just keeps going & going. They were tired from running around in the sun, but I'm still not sure how Maggie manages to ignore the beast. The Punks seems to take him in stride. That's great. Loved this. Don't worry, we call him much worse! :) He was at Buddy Dog, they remembered my Dad asking if they ever had giant schnauzers and called me when Griffin was brought in. He was Maggie's size at 3 months when I brought her over to B Dog to get pics for my parents! Maggie occasionally has enough and chases him across the yard. I have to get a video of her snarl face next time. Zuni's new haircut & Toby too!